Mercedes-AMG has set a new lap record for production 4-door cars on the famed ‘Green Hell’. 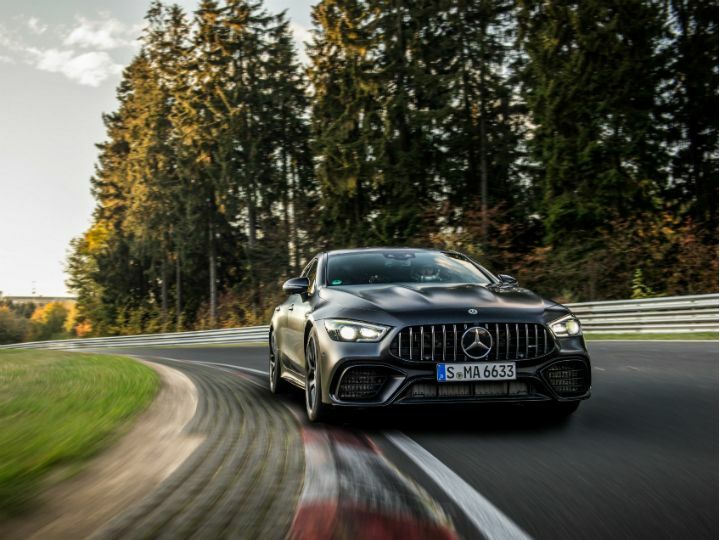 With a time of 7:25.41, the four-door version of the AMG GT beat the Alfa Romeo Giulia Quadrifoglio’s Nürburgring Nordschleife lap time by over 6 seconds. The record-setting Mercedes-AMG GT 63 S 4Matic+ has a 4.0-litre, twin-turbo petrol V8 developing 639PS of maximum power and 900Nm of mountain-moving torque. The crazy Germans from Affalterbach have set a new lap record at the Nürburging Nordschleife....in a four-door coupe! The Mercedes-AMG GT 63 S 4Matic+, driven by the company’s development engineer Demian Schaffert set a time of 7:25.41 to become the quickest 4-door production car to have gone around the track ever. A 2-tonne 4-door coupe needs all the help it can get to be in the same league as some serious sportscars, which includes some who are legendary in their own right. The list includes the Lamborghini Aventador LP 700-4 (which was faster by .41 seconds), the Ferrari Enzo (faster by .20 seconds), the Mercedes-Benz SLS AMG Black Series (slower by .26 seconds) and the KTM X-Bow RR (slower by .32 seconds)! How did they do it? The Mercedes-AMG GT 4-Door Coupe seemed to have been made because there were too many of the hand-made 4.0-litre, twin-turbo V8s lying around the factory floor, and someone thought plonking them under the hood of a full-sized four-door coupe made the best business sense. The 63 S 4Matic+ has some serious kit in though - intelligent AWD, rear-wheel steering, active rear wing, electronic locking rear differential and, of course, that torquey twin-turbo V8 engine. Share your experiences with AMG GT? Why Is Mercedes Counting On A Four-Door AMG GT?